The main opposition Maldivian Democratic Party (MDP) has raised hope of freedom for convicted opposition leader and former president Mohamed Nasheed by July 26, the day Maldives marks 50 years of independence from the British. Nasheed’s jailing on terrorism charges, relating to the arrest of a judge during his tenure, sparked months of daily protests and historic anti-government marches. Diplomatic pressure has been mounting on President Abdulla Yameen to release Nasheed and other political prisoners, including two former defence ministers and ruling party MP. While Ibu struck a hopeful tone, the government representative, home minister Umar Naseer was more cautious. He said the government had made no commitments on releasing jailed politicians, but reiterated that the government stands ready to make compromises for long-term stability. Nasheed was transferred to house arrest in late June after the opposition backed a constitutional amendment that will allow President Abdulla Yameen to replace his deputy. “On whether political leaders will be released, we did not give any commitments. But we did give one commitment, that is to make concessions, to make compromises where possible. We want to ease political tensions. For there to be engagement and dialogue between the MDP and the government. If such an environment is created, it will be easier for us to make concessions. I cannot directly state that the government will make a specific compromise. But I will say if such an environment is created, the government stands ready to make all compromises. In the past three weeks, we have made compromises, and we have seen progress. This does not happen with just one meeting. This is the third official meeting between MDP and the government. In other countries, it can take 100 meetings,” he said. Since Nasheed’s transfer to house arrest, the government has removed a freeze on Jumhooree Party leader and MP Gasim Ibrahim’s tourism businesses. Gasim, who had spent nearly three months abroad amidst rumors of impending arrest, returned to the Maldives on Sunday morning. Gasim’s JP had also backed the constitutional amendment. The parliament is due to vote to impeach vice president Dr Mohamed Jameel Ahmed by July 26. Many believe the president is seeking to replace Jameel because he wants a more loyal deputy ahead of a major surgery for a life-threatening condition. The MDP has repeatedly said Nasheed’s freedom is the party’s highest priority. The two representatives also said they have established a hotline to facilitate communication and to resolve any issues that may come up. “There’s been progress, You will be able to see this in the future. Talks are proceeding in a friendly and conciliatory environment. I note we are already seeing results. The public will see even more progress when we sit for a next meeting,” Ibu said. The fourth meeting of talks has been scheduled for July 21. Naseer meanwhile said the government, at the ongoing talks, is not pressuring Nasheed to appeal his 13-year jail term at a domestic appellate court. The foreign ministry this weekend urged the opposition leader to appeal in a response to the UN working group on arbitrary detention. Naseer also said the government will look at provisions in the Clemency Act and the Parole Act in reducing jail terms or releasing other jailed politicians, but only after they exhaust appeal processes. The MDP has proposed six measures for political reconciliation at the ongoing talks. In addition to asking for the release of politicians and withdrawing “politically motivated charges” against some 1400 opposition supporters, the party has also called for an independent inquiry into the murder of MP Afrasheem Ali and the disappearance of Minivan News journalist Ahmed Rilwan. Discussions have not progressed on the latter demand yet. Naseer meanwhile said the government is reviewing the charges against the 1493 people. “This government does not want to charge and punish those who have committed minor offences in political activities. President Yameen has given me a special instruction on this,” he said. However, the government does not want to be lenient on individuals who may be pretending to be political prisoners, especially those with criminal records, he said. The government has also committed to speeding up progress in the separate talks with the JP and the religious conservative Adhaalath Party. Another major demand by the MDP in the ongoing talks is a change from the Maldives’ presidential system of government to a parliamentary system. Discussions on the system of governance will take place at a second stage of talks, the representatives said at an earlier press conference. 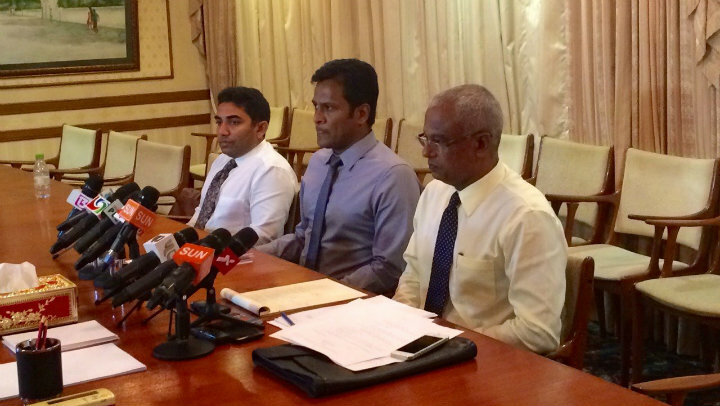 The government has cancelled a third meeting in ongoing talks with the main opposition Maldivian Democratic Party (MDP) as some ministers are out of the country, the president’s office has said. The government was due to propose mechanisms to release jailed opposition politicians and withdraw charges against more than 1,400 opposition supporters. 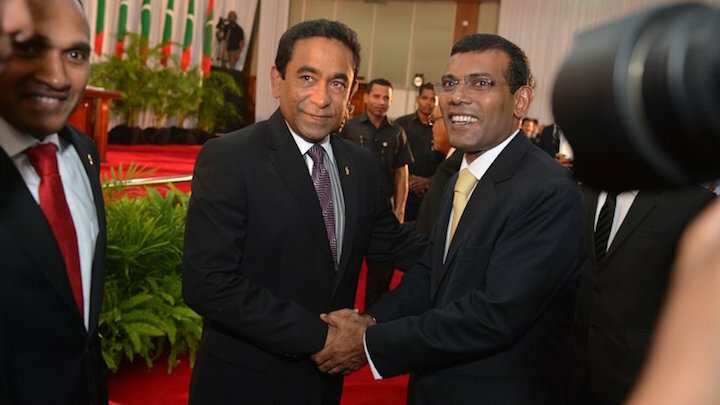 The long-awaited talks has raised hope of an end to a six month long political crisis that was triggered by the arrest and imprisonment of former president Mohamed Nasheed. The MDP had proposed that talks conclude within a two-week timeline. Minivan News is awaiting comments from the MDP and the president’s office on whether the cancellation could be considered a setback. A date has not been set for the next meeting. MDP parliamentary group leader Ibrahim ‘Ibu’ Mohamed Solih is representing the party, while the home minister, the fisheries minister and the presidential affairs minister are representing the government. President Abdulla Yameen’s proposed agenda for talks comprised of three aspects: political reconciliation, constitutional and judicial reform, and political party participation in development. The government has conceded to an MDP demand to commence all-party talks at a second stage of talks when constitutional and judicial reform is discussed. Three separate teams of ministers were assigned to the MDP, the Jumhooree Party (JP) and the religious conservative Adhaalath Party. Nasheed was transferred to house arrest in late June. The opposition subsequently backed a constitutional amendment that will allow the president to replace his deputy Dr Mohamed Jameel Ahmed. “I believe this is the time for major reconciliation by finding a consensus through talks. The government, to show its sincerity, will make all the concessions we can,” home minister Umar Naseer had said at a first meeting of the talks. Ex defence ministers Mohamed Nazim and Ibrahim Tholhath, and former ruling part MP Ahmed Nazim were also sentenced to jail within weeks of Nasheed’s sentence. Meanwhile, Adhaalath Party president Sheikh Imran Abdulla is in police custody awaiting a trial on terrorism charges over a historic anti-government protest on May 1. Ex-MP Nazim was hospitalized today over back-pains. Two senior JP leaders and the MDP chairperson Ali Waheed have fled the country. The three were also arrested on May 1. JP deputy leader Ameen Ibrahim and council member Sobah Rasheed were charged with terrorism, but formal charges have not been brought against Waheed yet. The government last week removed a freeze on JP leader Gasim Ibrahim’s Villa group accounts. Gasim has announced he will retire from politics when his term as MP expires in 2019. The tourism tycoon left the Maldives in late April and has not yet returned. The newly passed constitutional amendment, which set new age limits of 30-65 years for the presidency, will bar Gasim from the 2018 presidential elections. MDP has said the opposition and government must come to an agreement on “politically motivated charges and sentences” before discussing constitutional and judicial reform. The MDP has also asked for an independent inquiry into the disappearance of Minivan News journalist Ahmed Rilwan and the brutal murder of MP Afrasheem Ali. The party has also proposed a change from the Maldives’ current presidential system to a parliamentary system. Representatives of the government and the opposition have said they are committed to a resolution and political stability. 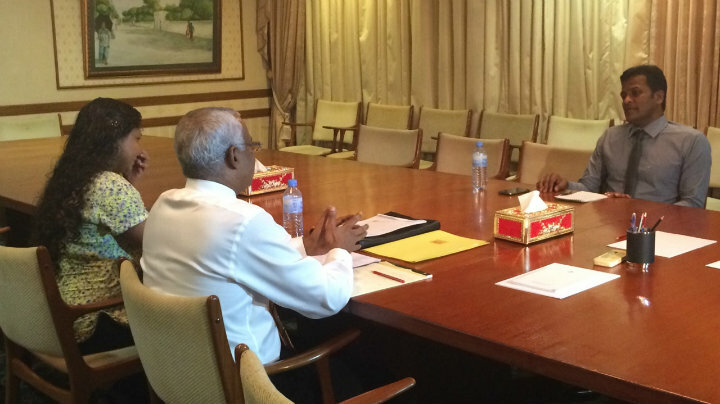 Talks with the JP are ongoing, but meetings between the government and the Adhaalath Party are yet to begin. Representatives of the government and the main opposition Maldivian Democratic Party (MDP) made an unprecedented show of commitment to resolving a six-month long political crisis tonight following a preliminary meeting ahead of talks. “I believe this is the time for a major reconciliation by finding a consensus through talks. The government, to show its sincerity, will make all the concessions we can,” Home minister Umar Naseer told the press. Naseer and the MDP’s parliamentary group leader Ibrahim ‘Ibu’ Mohamed Solih met at the President’s Office at 11:00pm on Wednesday night, and discussed the agenda and structure for the long-awaited negotiations. “We believe the government is ready to come to a resolution. That is why we are sitting down. I have high hope that we will find a solution,” Ibu said. The Maldives has been gripped by political turmoil since the arrest and imprisonment of ex-president Mohamed Nasheed and ex-defence minister Mohamed Nazim. Hundreds were arrested in protests and key figures were charged with terrorism. Diplomatic pressure has been mounting on President Abdulla Yameen’s government to release all political prisoners, including Nasheed. “We have not spoken on the substance of the talks tonight, meaning on what it is that we will agree on, or what we cannot agree on. We spoke on the design of the talks, and how we will proceed,” Naseer said. A second meeting will be held on Sunday (July 5) at 10:30pm. “We noted even tonight that there is common ground. Our two parties are very mature. Both have ruled, and both have been in opposition. Both parties have experienced all there is to experience in the political sphere,” Naseer said. Nasheed was transferred to house arrest for eight weeks in June, after the opposition backed a constitutional amendment to allow President Yameen to replace his vice president. The government’s agenda, proposed in mid-May, includes three aspects – political reconciliation, constitutional and judicial reform, and political party participation in development. Agreement to talks between all parties, including ruling Progressive Party of the Maldives (PPM), the MDP, the Jumhooree Party and the Adhaalath Party. The MDP also presented Naseer with papers on the government’s agenda points. After an agreement is reached on political reconciliation, the MDP has proposed that the parties begin discussions on judicial and constitutional reform and development. “Our party has governed within a presidential system, and so has the ruling party. Every time, it is the candidate who wins the second largest number of votes who comes to power, through a coalition. But the coalition falls apart soon afterwards and the government is plunged into turmoil. We have experienced this system and we have not seen good results, so lets change to a parliamentary system,” Ibu said. The paper on political party participation in development includes some 40 proposals, Ibu said. President Yameen had first proposed talks on May 14. But there was no progress after the government ruled out negotiations over Nasheed and Nazim’s release and vetoed Nasheed as an MDP representative. When the opposition leader was transferred to house arrest, the MDP said it will continue with talks without Nasheed. Assuring the public of the government’s commitment to a resolution, Naseer said they stand ready to make any concessions necessary by amending laws. “We have compromised even when it was really hard for us. We will do so in the future. The MDP represents a large portion of the Maldivian public and is among the largest political parties. It will be much easier for this government to achieve the development, progress that we seek with them, in light of discussions with them,” he said. Home minister Umar Naseer has claimed that more than 100,000 students and teachers participated in a parade held yesterday to celebrate the upcoming golden jubilee of independence. Naseer’s claim was met with skepticism on social media as the number of students in government, community and private schools in the Maldives is 86,799, according to official figures. Thousands of students, teachers and parents across the country joined the parade on Saturday in what the home ministry said was the “biggest event” held so far with the participation of students. Students from the atolls marched on the main street of their island while the parade took place on Majeedhee Magu and Ameenee Magu in Malé. “We can say with a lot of certainty that over 100,000 students participated in the event,” said home ministry’s media coordinator Thazmeel Abdul Samad. Over 100,000 students & teachers across the country participated in today’s Minivan50 School event. Thank you all. The parade in the capital started from the Maafannu stadium, went through the city’s main thoroughfare, and ended back at the stadium. Home minister Naseer, foreign minister Dunya Maumoon, education minister Dr Aishath Shiham, and other high-ranking officials took part in the parade, wearing national colours. The parade concluded with a skydiving event at the Maafanu stadium with the four foreign skydivers signing autographs and taking photos with participants. The skydivers are due to conduct a training exercise for 15 locals for a skydiving event planned as part of the celebrations for the 50th anniversary of independence on July 26. Other events planned by the home ministry to mark the golden jubilee include a swimming competition, a sea sports festival, a world record attempt, float parades, an international football tournament, a police tournament, several music shows and the unveiling of the new currency design. The government has also started decorating the streets of Malé with national flags and sacrificed 150 goats in a public ceremony in April. The Independence Day celebrations have drawn criticism over the lack of transparency of expenses made out of the state budget. However, the ‘Independence 50’ office under the home ministry has said that most of the work is done by volunteers. The Local Government Authority (LGA) has suspended seven councilors who took part in an anti-government demonstration on May 1. All seven had been arrested in a police crackdown after protesters attempted to enter Malé’s restricted Republic Square. They were suspended for two months, local media reports. Councilors are elected for island and atoll councils for three years. There are over 1000 councilors in the Maldives. According to the main opposition Maldivian Democratic Party (MDP), some 300 of its 450 island and atoll council members had taken part in the protest. 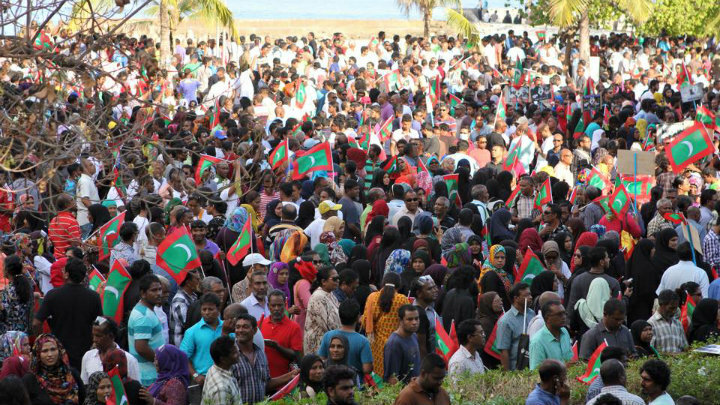 Some 7000 people had traveled to Malé from Maldives’ remote islands for May Day, the opposition has claimed. Nearly 20,000 protesters took part in the May Day march and demanded the release of imprisoned ex-president Mohamed Nasheed and ex-defence minister Mohamed Nazim. 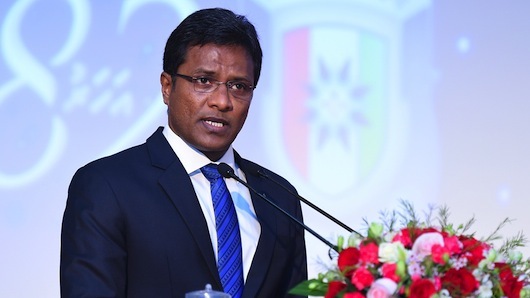 Home minister and president of the LGA, Umar Naseer, has also asked the anti-corruption watchdog to penalize any councilors who had traveled to the capital on state funds. According to the opposition coalition, 12 employees of the state were dismissed for participating in the protest. Home minister Umar Naseer has vowed to keep ex-president Mohamed Nasheed in prison despite growing calls for his release by the international community. “We will not free Nasheed. This government will not free him. I repeat it,” Naseer said in an interview on pro-government private broadcaster Dhi-TV on Thursday. Nasheed is serving a 13-year jail term on terrorism charges relating to the arrest of a judge during his tenure. Foreign governments, international bodies including the UN and Amnesty International have criticized the trial for lack of due process. The EU parliament in April passed a resolution calling for Nasheed’s immediate release and have urged member states to warn tourists on Maldives’ human rights record on their travel websites. “There is no way will we hand the country to MDP. We will not back down an inch even if they come with 50 countries behind them,” he said. Naseer said the MDP had planned to torch several buildings during a mass antigovernment protest on May Day. Nearly 200 people, including opposition leaders, were arrested when violent clashes erupted between the police and protesters. Approximately 20,000 people had taken to the streets on May 1 over Nasheed and ex-defence minister Mohamed Nazim’s imprisonment. Although the opposition has criticized the police for excessive force and brutality during the protest, Naseer congratulated the police force, saying they are the “most professional” force in the region. He said the police had ten years of experience in controlling protests and condemned protesters for beating two police officers. “MDP can only deceive others [the international community], not Maldivians,” he said. The home minister once again denied allegations he had made of president Abdulla Yameen’s involvement in the brutal murder of MP Dr Afrasheem Ali in 2012. Naseer had contested against Yameen during the Progressive Party of the Maldives’ (PPM) presidential primaries of 2013. When he lost, he held a public rally accusing Yameen of corruption, vote-rigging, illicit connections with criminal gangs, and said he saw a suspect in Afrasheem’s murder meeting with Yameen. Naseer was expelled from the PPM when he refused to apologize for his remarks. He joined the Jumhooree Party (JP), and was given a cabinet portfolio after Yameen won the second round of polls with JP’s backing. The party left the ruling coalition in January. “I said I saw a suspect in Afrasheem’s murder, after he was released, at the PPM office seeking a meeting with president Yameen. I did not say there is any connection between president Yameen and Afrasheem’s murder,” he said. Naseer on Thursday said he had made the comments because of the “rivalry in the campaign,” and said the investigation does not suggest the president was involved in the murder at all. In recent months, several defectors from the ruling coalition, including MP Ahmed Mahloof, have claimed president Yameen will know the truth behind Afrasheem’s murder. In December 2012, then-police chief Abdulla Riyaz had said that Dr Afrasheem’s murder was politically motivated with a local gang offered MVR4 million (US$260,000) to carry it out. The late moderate religious scholar and Progressive Party of Maldives MP was brutally stabbed to death on October 1, 2013 in a murder that shocked the nation. Riyaz, now a JP MP, was summoned to the police last week when he said he would reveal details of Afrasheem’s murder “when the time comes” in an interview with a local TV station. Hussain Humam, the chief suspect in the murder and the only person convicted of the crime so far, has alleged president Yameen and tourism minister Ahmed Adeeb’s involvement in the killing. However, Adeeb accused the opposition of orchestrating Humam’s remarks in a “character assassination” attempt. Humam had said at the first hearing of his appeal at the High Court last month that president Yameen and Adeeb “will know best” the details of the murder. Former president Maumoon Abdul Gayoom meanwhile told reporters that president Yameen should sue opposition politicians alleging his involvement in the murder for defamation and strongly condemned the insinuations. The home ministry is attempting to intimidate island councillors by requesting a list of councillors present in Malé during a mass anti-government protest on May Day, the opposition has said. Home minister and head of the local government authority, Umar Naseer, last week also asked the anti corruption watchdog to penalise any councillors who may have traveled on state funds to the capital this weekend. Councillors are required to inform the LGA or the island council before traveling out of their islands. Nearly 200 people were arrested and scores were injured in violent clashes at the largest anti-government protest in a decade. Meanwhile, several opposition dominated councils have passed resolutions to boycott the home ministry’s celebrations for the golden jubilee of independence this year. The ministry has threatened to dissolve such councils. The opposition is protesting over the imprisonment of ex-president Mohamed Nasheed and ex-defence minister Mohamed Nazim. Despite a crackdown on and the dispersal of the May Day protest, the allied opposition parties say they will continue with daily protests. Deputy chairperson of the main opposition Maldivian Democratic Party, Ali Niyaz, said 300 of the party’s 450 councillors had taken part in the mass protest. There are over a 1,000 councillors for 188 islands and two cities in the Maldives. “Most of the councillors travelled to the capital using their own funds while others passed resolutions and travelled using state funds,” Niyaz said. President of Baa Atoll council, Adil Mohamed, has accused the government of attempting to destroy decentralisation in the country by its threat to dissolve councils. “They could take any action against councillors, but that will fail to hide the suffering of the people,” he said. The MDP councillor also criticised the government’s decision to discontinue electricity subsidies to businesses in the islands saying many businesses were now heading into bankruptcy. Hussein Shaamil, council member of Meemu Kolhufushi, said that councillors were elected for public service, and said he would participate in whatever political activity necessary, whenever required. Shaamil also called upon the Alif Dhaal council to defend its motion and pledged to support the atoll council. The government is working on a new law to deter a growing number of Maldivians seeking to join radical Islamic movements in Iraq and Syria. Home minister Umar Naseer told Haveeru the attorney general’s office had drafted legislation that would criminalize the act of leaving the Maldives to participate in foreign wars. However, the attorney general’s office said only “discussions had been held on drafting a law.” Naseer was unavailable for comment as he is currently in Qatar for a UN congress on crime prevention and criminal justice. The police chief in January said there are over 50 Maldivians fighting in foreign wars, but the main opposition Maldivian Democratic Party estimates the number to be as high as 200. 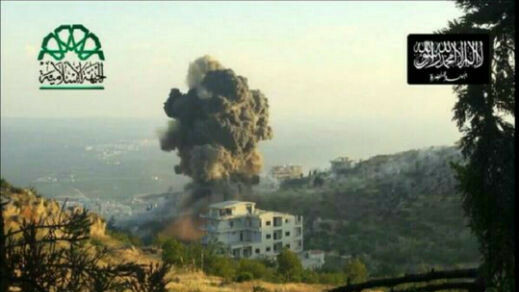 At least seven have reportedly died while fighting in Syria in the past year. Another seven Maldivians were arrested in Srilanka and Malaysia on the suspicion of attempting to travel to Syria for jihad, but were released in Malé as the law does not recognise the act as an offence. Prosecutor general Muhthaz Muhsin welcomed the move, but said Maldivians going abroad to fight in foreign wars could be prosecuted in provisions in the new penal code. The penal code was due to come into force on Monday, but the ruling party delayed it by three months claiming more time was needed to raise awareness on its provisions. “I believe putting a stop Maldivians going abroad to fight is very important. The new penal code would be helpful in these kinds of cases,” Muhsin told Minivan News. The new penal code criminalizes participation in a criminal organization and contributing money to such an organization. The law must criminalize financing and membership of terrorist organizations, and recruiting members and training in such organizations, they said. The Police Commissioner Hussain Waheed earlier this year said that the police are tracking individuals associated with foreign militant groups. Maldivians who have reportedly left the country for Syria include immigration officers, hospital workers, members of Malé’s criminal gangs, and entire families including infants. Suspects in the murder of an MP and the disappearance of Minivan News journalist are also reported to have left for jihad.